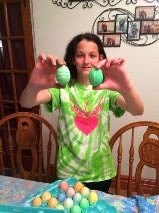 Decorating Easter Eggs is one tradition we do every year. The first year Mike and I were married I made him decorate & hide Easter Eggs with me. I'm sure he was thrilled, but he was willing to do anything I wanted to do. After decorating I always ask the girls to show me their favorite egg for the year. 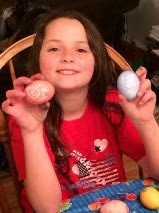 Of course Alaina had to draw a pig on one of her eggs! At least she drew a rabbit on another one. 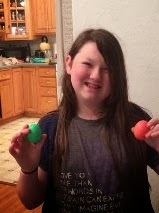 Delaney liked her darker eggs this year. She had to let them sit in the dye for awhile to get them that dark. I think Amber is into green this year. 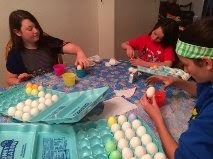 I'm glad my girls still enjoy decorating eggs & I hope they continue to enjoy it for a few more years.